Many of our neighbors cannot find work without dependable transportation. Living in the shelter or a rooming house, there are not many jobs within walking distance of downtown. Having a reliable bicycle allows them to widen their job search area and to make it to doctor and counseling appointments. 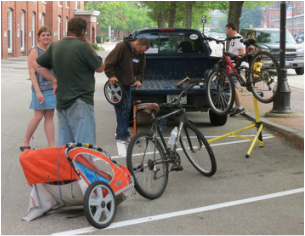 The bike ministry helps provide bicycles to neighbors with a need for transportation, along with a bicycle lock and helmet. We have an excellent mechanic with a passion for taking old, unwanted, donated bikes and repairs, rebuilds, and restores them to working condition, often taking parts from some old bikes to repair others. We are always in need of men's and women's bicycles in any condition. If you have a bicycle that you are not using (or even spare bike parts), just contact us and we will pick it up. Something you are not using can make a huge difference in improving the life of a neighbor in need! On the third (3rd) Saturday of each month, a bike repair station is set up at the 1269 Cafe located at 351 Chestnut St (old Police Station). This provides basic repairs of our neighbors bikes. For donations, any bike ministry questions or to volunteer with the Bike Ministry, send Chris an email to bicycles@doyouknowhim-nh.org. To date, we have distributed over 45 bikes! Bicyles ready to go or waiting for repairs!